Christmas is fast approaching and over the weekend more preparations have been completed. My nephew is getting married the weekend before Christmas so we need to be more organised this year! I spent most of my childhood Christmases in Germany and so some of their traditions have been adopted into our Christmas celebrations. Lighting the advent candles on the four Sundays before Christmas was one of these traditions - we lit our second advent candle this evening. Christmas for us is about not spending huge amounts of money on presents, but a special family time of celebrating simply with home-made food, following old family traditions and having fun together. Our Christmas decorations have become simpler and more natural over the years, taking greenery from the garden. This year I have used the hydrangea heads to make a wreath. Rudolph the reindeer has reappeared - he has been in our family for many years and was made by a local man. There is quite a herd of them in our locality! I have just added a Pinterest button to the side of my blog. I don't use it very much as I don't have time, but I have found it good way of picking up quick ideas and inspirations - see my Natural Christmas board for more great Christmas ideas - you will also see where some of the ideas featured here have come from! I also love looking at how Christmas is celebrated in other countries. 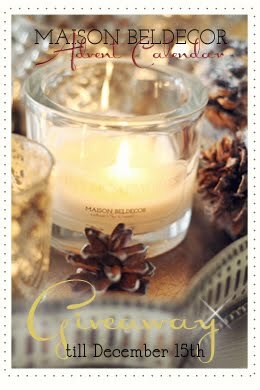 Sabine from Maison Beldecor has some beautiful ideas and also makes her own scented candles and she is having a giveaway. Our Christmas tree will be decorated next weekend, when our daughter comes home. How are your Christmas preparations coming along? Gardening Bren from Nova Scotia has come back to me with a link. Wishing everyone a good week thank you as always for your lovely comments and for taking a few moments to pop by. Hello Sarah, it looks very nice at you home. And I love Rudolf he looks so cute, and the wan he made him he did a good job. Have a great time before Christmas and enjoy to make your home a Christmas home. We had a lot of snow last vryday, and that looks very nice for the time before Christmas. Greetings Petra. That wreath is lovely, so original. I loved seeing your Christmas decorations and always great to see different ways to decorate and traditions of other friends. The hydrangea wreath is a lovely idea - have some flowers around my garden so might do this. Also like the Christmas banner and the pinecones. All of your Christmas decorations are charming, and I like your philosophy on Christmas. Sometimes we make it all too difficult and expensive with the burden falling on the same people all of the time. It should be a time just to relax and enjoy being with the family. Love all your decs they look very pretty. I must admit after years of putting up so much, i've come to the conclusion that less is best. Have a good week. Your Christmas decorations are beautiful. I love natural decorations best. We lit our second advent candle today as well. The little angel seems to be going 'OH!' in surprise that Christmas has come round so fast. I hadn't expected ever to have anything in common with an angel. I have used Rosemary as we don't have any fir trees in the garden! We will take a wander into the woods and lanes closer to Christmas to gather some fresh greenery. Ich wünsche dir eine besinnliche Adventszeit mit all deinen Lieben und grüße mir die englische See. I spent the summer making quilts for all the kids and grandkids. And I cut cedar from the field and boxwood from the yard to make my wresths and brought some cedar into the house for the smell of Christmas. I think as you that it's more about family and feeding them this year and not about the expensive gifts in the shops. I really like the decorations good for you! jetzt habe ich mir auch Rosmarin gekauft, deine Dekoidee hat mich inspiriert, vielen Dank dafür! Falls du Sehnsucht nach deutschen Weihnachtsleckereien wie Lebkuchen, Printen, Dominosteine oder Christstollen hast, dann teile mir über meine e-mail-Adresse deine Anschrift mit und dann werde ich dir ein kleines, deutsches Weihnachtspäckchen schicken. Einfach nur so, weil ich dich mag und weil Weihnachten ist, die Zeit der kleinen Wunder! I love natural decorations too. I gather stuff from the garden and also go foraging down the lane at the allotment. I'll be making my christmas wreaths in the next few days. We bought the christmas tree last week but it's out in the garden in a bucket of water as we're going to our daughter's for the weekend, so we'll bring it in and decorate it when we get back. It all looks so lovely - I look forward to having a nosy at your pinterest boards! Christmas has crept up on me this year. I usually have the gifts bought and wrapped my the end of November and am all organised with cards etc but this year I am so behind and I'm feeling stressed about it for the first time ever! I wont' let my usual order slip again! I haven't started yet as I have been away! I agree so much about finding the balance with Christmas and understanding the real magic in the season.. Thank you for the welcome! I really like the hydrangea wreath - so imaginative and the colour is lovely! We light advent candles too ... I have mine in a pot of trailing ivy. Your wreath is wonderful, I now have serious wreath envy. And the photos in your last post, which I just caught up with, yet again had me aching to be by the sea! It is looking very festive with you. I'm slowly getting into the swing of it though the tree is still sat in the back garden - I may just decorate it from there. Your Christmas preparations are lovely and I really enjoy the simplicity of them with all the greenery, pinecones, and Mr. Reindeer too! Love the hydrangea wreath too. Your decorations are very pretty. I like the arrangement around your chimney and also your wreath. We went to visit an historic house in our area, all decorated for Christmas – that made us feel more in touch with the season. I have been somewhat late with comments this week. put up my post late last night.. Thank you for your sweet comments. My home is the same.. very simple . Like you say, its all about family and this year there will be 30 just family alone..all together for the first time.in 20 years. your decorations are so lovely.. simplicity is beautiful. I love all the decorations. I wish I had time to make my house look festive, but I'm always at the shop and when I get home all I want to do is wear my pajama and die on the couch! PRECIOUS SARAH and Daisy girl! Your cottage is sweet with love and beautiful decorations, celebrating the life within YOU! Walk by the sea or Brad Pitt?